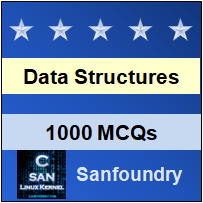 This set of Data Structures & Algorithms Multiple Choice Questions & Answers (MCQs) focuses on “K-ary Tree – 2”. 1. What is the size of the given K-ary tree? 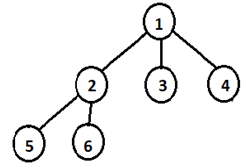 Explanation: Size of the K-ary tree is defined as the total number of nodes present in the tree. Since there are total of 6 nodes in the K-ary tree. So the size of the K-ary tree is 6. 2. Who is the ancestor of Node H? Explanation: Ancestor node is a node that comes in between the path from the node to the root. Since Node D comes between node H and root, so Node D is called the ancestor node. 3. Who is descendant of Node C? Explanation: Descendant node is a node which has a direct path from ancestor node. Since Node G is connected to C, so Node G is the descendant of Node C.
4. What is the size of Node B in given K-ary tree? Explanation: Size of node is defined as the total number of descendants of that node including itself. So, size of Node B is 1. 5. Can leaf node be called child node in a K-ary tree? Explanation: Leaf node is a node that has no child. Since Leaf node will always be the node on the last level of k-ary tree, so it can be called child node of given parent node in K-ary tree. 6. Can child node be always called Leaf node in the K-ary tree? 7. What is the upper bound for maximum leaves in K-ary tree with height h? Explanation: In the K-ary tree having height h, the upper bound for having maximum number of leaves is k^h. 8. What is the height of a K-ary tree having only root node? 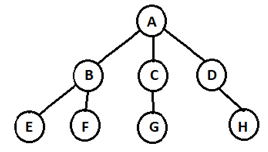 Explanation: Height of a K-ary tree does not include the root node. So the height of the K-ary tree is without root node is 0. 9. Which one of the following is the correct formulae to find the parent node at index I? Explanation: The parent node for the node of index I in a K-ary tree is given by (I-1)/K. 10. Which nodes are the siblings of Node D of given ternary tree? Explanation: Siblings are the nodes that share same parent. Since both the Node H is parent Node D, So the sibling of Node D is Node H.
11. How many extra nodes are there in Full K-ary tree than complete K-ary tree? Explanation: Every Full K-ary tree is also a complete K-ary tree. Therefore, both have same number of nodes. 12. Is Node A sibling of Node B in the given K-ary tree? Explanation: Node D, Node C are the siblings of Node B while Node A is the parent node of Node B.